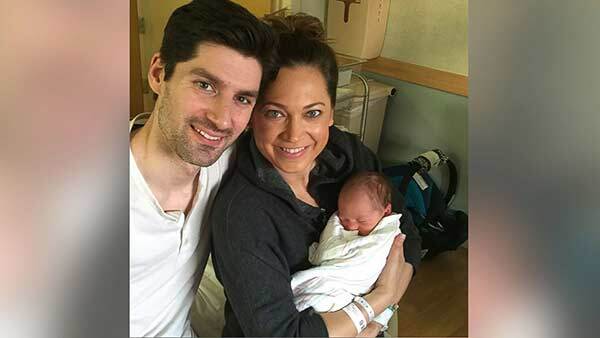 NEW YORK -- ABC News chief meteorologist Ginger Zee and her husband, Ben Aaron, have welcomed their first child, a healthy baby boy named Adrian Benjamin Colonomos, ABC News reports. Zee, 34, gave birth at 11:05 a.m. on Saturday in New York City. The baby weighed in at 7 pounds, 8 ounces. On Friday, in her last appearance on "Good Morning America" before giving birth, Zee was feted by her co-anchors with sparkling cider, cupcakes, a diaper cake and more. While expressing gratitude for having a "really good pregnancy," Zee also explained what had been keeping her up at night in the final stage of her pregnancy. "I wake up. I feel him move and I think, 'There's a real human in here. This is happening,'" Zee said. It was also on "GMA," last June, that Zee announced she and Aaron were expecting their first child. "The forecast for delivery is in December," Zee said at the time. The Rockford, Michigan, native took "GMA" viewers along on her pregnancy journey through her blog, "Ginger Zee's Baby Adventure." Zee's more than 40 blog entries covered her experiences as a first-time expectant mom, with topics ranging from maternity clothes to her plan to use cloth diapers to her most recent entry last week titled, "My Hips Are Killing Me." Zee told "GMA" viewers on Friday that she looks forward to seeing them again soon after time off with her newly expanded family. "I'll see you in a bit," Zee said on-air. "Don't worry. I'm coming back." Zee and Aaron, who wed in June of last year, live in New York City.